Empire Grade is a country road that heads inland from Santa Cruz for many miles toward the depths of the Santa Cruz Mountains. As its name suggests, most of it is in the form of a sustained climb, though not a very consistent one. (More on that below.) Most of the later parts of the road included on this ride follow the spine of a major ridge marked on the USGS topograpic map as Ben Lomond Mountain. This ridge roughly parallels the coast some distance inland and drops steeply toward the San Lorenzo River valley on the inner side while descending toward the ocean more gradually on the other side over a confusion of valleys, smaller ridges, and ravines. Since Empire Grade parallels the busy Route 9 fairly closely and doesn't connect to any major centers that the latter road doesn't reach, its traffic is very light. These factors make it a good road for bicycles. This ride is a good option as a stiff workout that combines some backcountry solitude and nature with a little sightseeing and window shopping. If you're not from the area, it would mesh well into the plans for a fun day or two in Santa Cruz. The total amount of climbing involved and the steepness of some spots on the route are fairly serious. But, almost all of the climb is done before any real descending on the loop, meaning that riders who are not very sure of the suitability of their fitness for this ride will have the possibility of bailing out during the climb and descending back. If my description of the position of Empire Grade on Ben Lomond Mountain made you think of a setting that's frequently open to ocean views on one side and forested mountains on the other, you might want to banish that thought from your mind. Other than what you might catch as you look down some streets at intersections within Santa Cruz, you don't get a single glimpse of the ocean. Except for a couple of partial views in a direction looking inland that you encounter through the trees near the highest reaches of Empire Grade, there are no views at all. This is not a ride to be done for nice views. While my main interest was in Empire Grade for this ride, I chose to do it in the form of a loop and return via different roads at least for the sake of variety. To be honest, the return half of the ride holds much less interest in terms of biking. The ride actually features a split personality in terms of setting. The first half feels remote and almost deserted. The second half goes through an almost unbroken string of homes and shops with heavier traffic. The frequently narrow and twisty Route 9 and its busy traffic is far from ideal for biking, in my opinion. So, for those who are after the ultimate in peaceful riding and a fun, long descent through a forest two-lane, my strong recommendation would be to ride Empire Grade as an out-and-back route instead. I expect that version of the ride to be much more rewarding. The natural spot from which to begin this loop is its southeastern end, since the largest population center along this route is Santa Cruz and most locals of this city will be inclined to begin the ride from some spot along this part. Picking a parking spot at this end of the loop also worked well for me, because the spot I picked is just off Highway 1 and very close to where Route 17 enters Santa Cruz, making this a convenient location to reach for people who might be coming from out of town like me. The suggested parking spot I point to is simply street parking on a neighborhood street. Parking on the particular block I point out is free but restricted to 4 hours between 8:00 AM and 6:00 PM, but that restriction is only enforced between September 15th and June 30th. This compares very favorably to the 2-hour time limit for parking that was in effect on some adjacent blocks at the time of my ride. The ride starts out through Santa Cruz neighborhoods on High Street. This wide street continues through a suburban setting either flatly or on moderate slopes for a relatively short distance before heading out of the city. On your way to the backcountry, you also pass by the UC Santa Cruz campus. When the name of High Street changes to "Empire Grade" at the Santa Cruz city limit near the 1.6-mile mark from the beginning, nothing really changes immediately. The road quickly settles into wooded surroundings and almost never leaves that environment until you're near the very end of the ride. The first steep segment of the climb that starts shortly after you enter that tree cover is also its worst part, which is a very good thing, because this half-mile stretch averages 10.5% grade end to end and reaches 19% grade at its steepest spot. If there is one characteristic feature of the overall climb on Empire Grade, it might be its unevenness to which I've alluded above. It's broken up by a lot of flattish and sometimes even downhill stretches. If you're a glass-half-empty kind of person, you might feel that those occasional descents are a waste of climbing effort. If you're closer to the glass-half-full camp, you may find them a welcome break from the uphill effort. The really tough part of climbing Empire Grade are the short episodes where the grade becomes seriously steep. There is no shortage of these. The grade exceeds 15% in four or five places, each of which arrive in steep spells that are never much longer than a quarter mile (with the exception of that first bad steep stretch). One pivotal point of the ride is reached when you arrive at the intersection of Empire Grade and Felton Empire Road. You can transform this ride into a fairly easy one by turning onto Felton Empire Road at that intersection and using that to get to Graham Hill Road. 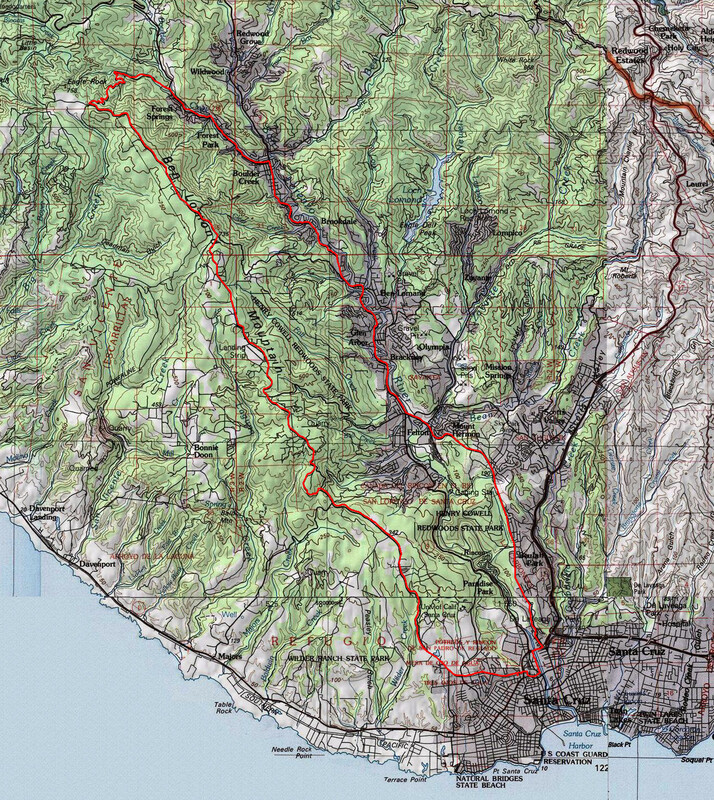 This will result in a ride length of 20.5 miles with only about 2500 feet of cumulative elevation gain. At the northwestern end of this elongated loop, Jamison Creek Road is where the "really descending" portion of your descent begins with a bang. This is a comparatively short but steep and very twisty connector between Empire Grade and Route 236. I remember encountering almost no traffic on this road during my ride, which was on a Saturday. For a capable cyclist under the right conditions, a fast descent on this road could be as fun as any amusement park ride. On the cold day of my ride, controlling my speed in order to reduce the wind chill effect on this very shady road was a higher priority for me than thrill seeking. The slope of the road starts out somewhere around -18% and only slowly dials back from there, ending up with an overall average grade of 13.5% over the first 1.5 mile of this descent. When the road settles in next to the bed of its namesake creek after that, its slope eases and this serves as a signal that you'll connect to Route 236 very shortly. The portion of Route 236 you traverse on this ride takes you on a very gentle descent through a scattering of residences in the shade of tall redwoods. You may not notice any discernable increase in the density of this settlement pattern until nearly the very end of this road where you suddenly find yourself on the main street of Boulder Creek, which is Route 9. Boulder Creek is a good spot for a rest spot not only because it arrives near the midpoint of the ride but also because it has a decent selection of stores, eateries, and watering holes. If you don't yet find yourself in the mood for such a spot, there's no need to worry, because you'll be seeing a string of other such small towns and hamlets between Boulder Creek and Felton. However, other than Felton (which you really only skirt past, rather than truly entering), all those others are much smaller than Boulder Creek. Still, along the part of this ride on Route 9, the next cluster of shops never seems to be more than a couple of minutes away. The part of the loop on Route 9 alternates at least a couple of times between relatively wide and straight segments that pass by businesses, and short, narrow, and twisty segments that squeeze past narrow parts of the San Lorenzo Valley. Those latter twisty parts see the space available for bicycles minimized and usually feature a concrete railing on the downhill side of the road where it's partially held up by a support structure. While these don't last long enough to be really bothersome, they are not comfortable moments of the ride. In fact, the turn onto Graham Hill Road is aimed at bypassing a portion of Route 9 where a longer segment like that would, in fact, become truly bothersome. Route 9 passes through a narrow canyon in Henry Cowell Park occasionally carried by viaducts and concrete retaining walls. The worst mile or so of this segment has the shoulder space going down virtually to zero and the traffic volume increasing to the road's maximum since you are closer to Santa Cruz. It's certainly possible to bike your way through this stretch as well, and perhaps some riders may even find it exhilarating. But, I don't savor the thought of riding in those conditions and that's why I recommend the return to Santa Cruz via Graham Hill Road instead. Graham Hill Road allows you the sensation of being in the backcountry for a few more miles after the long and busy stretch on Route 9. The ride also saves one last tough climb for this stage. This last spell of climbing on Graham Hill Road where you gain 440 feet in a touch over a mile is no joke. The average grade of the most serious half-mile stretch during this climb exceeds 11%. Traffic density is moderate to light as you head out of Santa Cruz in the beginning of the ride, and it's somewhere in the range of light to very light on Empire Grade. Things suddenly turn busy as soon as you make it to Route 236. Here, traffic volume is fairly heavy and there is no shortage of large pickup trucks that don't always seem to pass cyclists with the utmost care. This traffic pattern continues until you reach Felton. Things calm down again when you turn onto Graham Hill Road, where the amount of traffic seems to be almost (but not exactly) as light as Empire Grade. Since the route could be said to re-enter Santa Cruz "through a back door" and connects back to the beginning of the ride via a bike path and a bike/pedestrian overpass, you don't really encounter busy traffic again after Felton (as long as you turn onto Graham Hill Road, that is). Meanwhile, the pavement quality was good all the way through at the time I did this ride. Empire Grade features occasional spots that feature an open sky, but the majority of the road passes through densely wooded areas as I already mentioned. The portion of the loop that begins when you turn onto Jamison Creek Road and ends when you arrive at Boulder Creek features the highest amount of redwood shade and is virtually a black hole in terms of sun exposure. Then, depending on the time of day, you start getting episodes of moderate sun exposure again on the leg of the ride on Route 9, though things don't turn to "mostly sunny" until you get close to Santa Cruz in the later reaches of Graham Hill Road. The shady segments of the loop would make this ride a good option for hot days. On the other hand, if you try this on a cold day like I have, the considerations are reversed; while the mostly shady climb on Empire Grade does not provide much of a problem due to almost constant exertion, the fast and shady descent on Jamison Creek Road can be freezing, and the patches of sun on Route 9 onward feel most welcome.